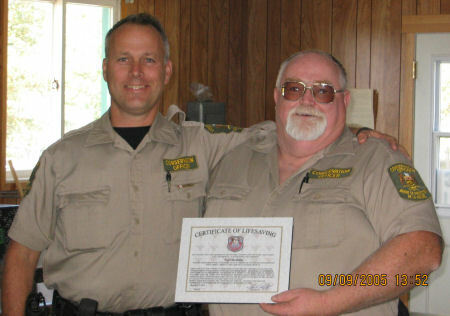 CO Rick Leblanc (left) present CO Ted Chisholm with 2004 OCOA Lifesaving Award. On September 11, 2004, Conservation Officer Ted Chisholm attempted to save the life of Tom Tuomi after Mr. Tuomi went into cardiac arrest at his camp on Lake Shebandowan, Ontario. While off duty and at his home in Shebandowan, Officer Chisholm was summoned to his neighbours home. His friend and neighbour Tom Tuomi was in discomfort and wanted help to get to the main cabin to lie down. In a short time, Mr. Tuomi went into cardiac arrest and becam unconscious. Officer Chisholm began administering first aid and CPR. He enlisted the help of his children in calling first response and Air Ambulance to assist. Despite their best efforts, Mr. Tuomi did not survive. Conservation Officer Chisholm is commended for his courageous lifesaving actions.